Is 666 An Angel Number? What Does 666 Mean? The number 666 in our world today has gotten a bad rap. For many people, seeing this number, or even saying it evokes fear, uncertainty, and mental images of the darkest of forms. All based on this verse in Revelation, the ego mind empowered by the media has run completely wild, and now 666 has become one of the most recognized symbols for the antichrist. So does this mean 666 is always associated with darkness? Is it a bad sign if you keep seeing 666? 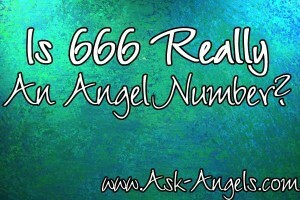 The angels assure us the answer is no, when they show us 666, they do so to convey a much different meaning. Seeing the number 666 isn't a bad omen or sign at all, and it's not a number you need to be afraid of. Its just a number! 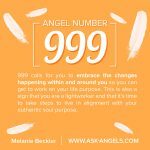 With that being said vibrationally, numbers do carry meaning and are often used to drawn our attention to messages and insight from the Angels and from the Divine. Seeing 666 does carry a message, but it's not ominous or foreboding like you might initially think. 666 most often appears as a spiritual wake up call from the angels! Have you been solely focused on material matters, and ignoring your inner voice and spiritual path? If so , it's quite likely 666 may appear with a message for you. 666 brings the guidance to listen to your heart not your head. Again, it's not a bad omen… It simply brings the message that you're a bit too focused within the illusions of the material plane. Quiet your mind, open your heart, and tune into your intuition and the guidance and wisdom of your soul and spirit. What your heart is really calling out for cannot be found by buying more material possessions and things, what you're looking for can only be found within you. 666 is a call to return to balance, to refocus on being present in the moment and taking your next step on your personal spiritual path to heal your mind, body, spirit and emotions. 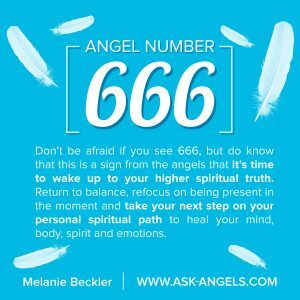 As 666 in popular culture does carry so much fear energy, seeing this number is also a reminder to release any fear and uncertainty over to your angels and into the light. Seeing 666 is a prompting for you to take a look at your thoughts. Are they in alignment with authentic love and joy? Or are your thoughts out of balanced and focused on material things, worries, fear, lack and doubt which don't serve, and which likely aren't even true. In a gentle and loving way, the angels may be communicating a warning message to you through showing you the number 666, but it's not warning that you need to fear, at all. Ready to learn more about numbers and their vibrational meaning? Check out this Free Numerology Reading here! You'll also learn what your name and birthday say about you! P.S. Do you ever see 666? Was this post helpful for you? Leave me a comment below and let me know, I love hearing from you! I recently found out I am getting laid off from my job. Which has been the icing on what I’ve felt has been a never ending emotional rollercoaster. In the course of four years I had my first child diagnosed with a rare genetic mutation effecting everything from her appearance to her cognitive development. I went through an abusive, unhappy marriage, that carried into myself being diagnosed with a rare form of cancer. There were a few months where I had to find acceptance with death, all while my wife has cheating on me. I divorced, tried to pick myself up, accumulated debt and a cutody battle. I’m not even 26 yet, and I’ve felt nothing but reaccuring depression and anxiety. Recently over the last few days I’ve seen 666 multiple times. I thought this was another sign of more to come, but reading your article – maybe something if anything good, can happen. Thank you. If you communicated clearly to somebody from your left ear inside, how can you differetiante from a spirit or someone who can speaks by telephaty. Ok I am a very youth boy and I really wanted to to know that 666 isit a bad sign because some say thisis bad and some say good who do we belivel and why? In a dream l was instructed to subtract 66 from unknown number to arrive in order to arrive at 666. Woke up did the maths. What is meaning ? I have been seeing 666 literally daily, sometimes multiple times a day, for probably 3 months now. My husband went through a job change, we moved, and have had other changes. I thought the 666 sightings were an omen that I was making wrong choices and following the wrong path. After reading this and a few other articles, I’m convinced it’s a sign that I’ve been focusing way too much on material things and money, which has been very true as of late, and really not in my nature. I’ve had more anxiety than I ever really have had. This makes me feel like I shouldn’t worry and just follow what I know is right and trust that everything will work out. I am so relieved! It is true, when I saw the number 666, I received a message, and I didn’t know how it got into my mind, but just after I saw 666 I thought of something which was helpful to me, and the angels did give me a solution to my challenges. I dream about 666 number. What does it mean? hi my names daniel. thankyou for the help in my question. you see one day i was listening to the radio on saturday after i had been to church. i was with my two brothers,as we were talking about something the radio volume went up and the song playing was repeating the chorus and the wods were:the devils inthe detail. it kept repeating itself over and over. this scared me a little. as i went to my car shortly after i read the odometre on the dash and in the numbers apears 666. i got the medsage right away. What syncronicity i thought. i have been having many more angel messages since and i can almost go back in time and receive more insight that the Lord showed me in the pasr that connect to the time of the message. is this a true connection to angels of God? i sm very weary of dark angels also.but i dont want to be deceived through my foolishness. if you hear this then may God bless xou. Saw 666 twice today at key moments, the second time reminding me to look it up. This reminder not to take my corporeality as gravely serious as I was, as the description on this site goes, came in the midst of a bad falling out with a loved one. It seems based on the timing that this description is accurate from my personal experience. Bought my car on 60/06/2016 accident happen 12/12/2016. He did let me know ahead in my dream but I don’t believe. Nina, the date above your comment just so happens to be 12-18, a concise combination of the two dates you mentioned. 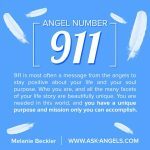 I have been reading about Angel numbers and other Angel stuff on your website. This is because i and am in search of some answers to some questions. It is difficult to know where to start, but i will tell you that all around me is negative energy and i don’t understand why. My instincts tell me i have to live the life i am living even though i feel Angels are letting me know they are with me, but only a little bit. Every day of my life i can find a coin, if only a penny or two. I don’t have to go long before i find a £10 note £20. White feathers too, or any colour to be honest with you. Last week at work i could smell a sweet scent and no one around me, except an Angel? I’ve seen flashes of light and in some really strange places. Butterflies too turn up to grab my attention. What i don’t understand is why. Here i am with no end of problems, feeling helpless and powerless to solve these problems, so why do they want my attention? They don’t appear to want to help me. Also, i am into photography. Photograph landscapes, seascapes and cities. Nothing strange about all that, but there are strange images in my photographs. I reckon i have taken well over 200 images in the last ten years, but don’t keep them anymore. I don’t understand them and have decided they are evil. I believe it is the spirits trying to contact me. One or two i believe are angels, but not sure. I have one or two images i carn’t explain and i will get more. I have one image taken this year on holiday in Cyprus. The image is of my girlfriend, but she is doing the devil sign with her right hand. (little finger and thumb up all other fingers folded down)Get this! She didn’t do the sign at the time i took the photo. What is going on? Is my girlfriend evil and i have been given a sign to tell me. You have to ask the angels for help they wont just intervene because of free will. The past month it so I noticed my shoes that my grandma bought me were saying 666 on the lable and in games two. Although when I was born, I was born in bed number 7 room number 7 and on the 7th of December, does that mean something? The Bible will have to change the 666 for 616 because the oldest manuscript found that talk about the number of the beast is 616 and not 666. My last 4 are 0666. I’m 36 and I have had nothing but bad luck my entire life. My husband always tells me to get my ss number changed. I only see the 666 when I am checking in on my kids or tight before I go to bed at night. It is only always on the digital temp monitor we have (even when the thermostat says the house temp is higher). I wonder why it’s just at these times? Thank you for this it kind of helped me to open up my heart more.the 666 has been in my life all my life,even my daughters SSN last four numbers are 3666,and when I saw that I knew I was in for a long battle between good and evil, one night back on 2_25_2014 I was praying too constellation Orion and 30 second’s after finished a huge light showed up and showed me my soul,20% of light was bright light and the other 80% was black it showed me this for ten seconds and then shot off into eastern sky,so I know there here and watching,caring for humanity,I don’t want to discourage them.I also have a witness to this and he was a mile from me when he saw it. At work I work in retail this Monday that number come up on my till. If I can discretely I make sign of the cross or pray in my head.I hope it is not negative. Thanks for this. I’ve always had a fear of this number and, lately, it’s been popping up everywhere. Even in the number of Facebook friends I had! I have been going through a rough patch in work and this explanation will help me to rediscover my spiritual side. I just wanted to express my sincere gratitude for delivering this information. I’ve been seeing the number 666 everywhere for almost a year now. It got to the point where I was afraid and in denial of the message, thinking it was the “mark of the beast” or a mere coincidence. But no matter how much I tried to not think about it and avoid the number, it continued popping up everywhere. Just now I saw a barcode 999 that was flipped around to make 666. It was starting to get ridiculous. I read this and realized that over the past year, I have stopped soul-searching and doing spiritual practice and focused only on material needs. Over the past year I have had a lot of depression because of this and constantly felt imbalanced energetically. Now I see the reason why I kept seeing the number 666, and I am not afraid of it anymore. I will continue spiritual practice and balance my life once again. Thank you,now I understand why 666 kept coming up in the past! My life was filled with fear and anxiety although a lack of material things was not in my thoughts, survival yes! Also having been a care giver to two cancer patients I feared I would not cope!Then I feared the time when I would be old and needed care! Fear played an exhausting role in my life and looking back everything turned out fine! One also overcome the fear of losing loved ones eventually! I still have fear but not overwhelming anymore! Thank you for your explanation of numbers! I was once given an interesting interpretation of 666 by a tarot teacher. She explained that 666 is the number of man (as in human being)and indeed Revelations does state that “for it is the number of a man”. 666 breaks down to the ‘9’ vibration which is the vibration of service to humanity. So this alleged great evil that is antithetical to Christ-like behavior will come from humanity, as in, a child born to human parents, who is human, will be taught to act in such a manner from his parents, environment, society, etc. or is in fact a sociopath that will rise to world power. In the last couple of thousand years, we’ve had quite a few megalomaniacs who fit that bill, haven’t we? That stated, only certain types of Christians believes in this particular chapter of their Bible, many other religions do not “buy” the story of Revelations and many interpret Revelations as relating to when the author wrote it during his times re: Roman invasion of the Middle East. On the other hand, there are many end of the world mythos (Norse, Egyptians, Greeks, Indonesian, Iranian, Chinese, Native American,to name a few)and more than likely these have all influenced (most especially in pursuit of the almighty dollar, the god of the modern world) current incarnations of the apocalypse mythology. It was perfect for me.thank you so much melanie.pls let me knw abt 888..i dnt knw why but from few days numbers are coming to me many times in a day.what does it mean ?